The songbook for 'A Beautiful Exchange' features all the chords and lyrics to the popular Hillsong album of the same name. All 12 of the songs from A Beautiful Exchange are featured in the book. A Beautiful Exchange features 12 songs with wonderful lyrics and elegant chords. These songs include Our God Is Love, Open My Eyes, Greatness Of Our God, The One Who Saves and many more passionate worship songs. The songbook is beautifully presented with a spiral bind that makes the book easy to hold open at a certain page. Each song has several pages dedicated to presenting its chords and lyrics. The chords are presented in bold font with the lyrics printed underneath to allow the reader to follow both at once. A Beautiful Exchange Songbook by Hillsong was published by Kingsway in July 2010 and is our 20714th best seller. The ISBN for A Beautiful Exchange Songbook is HMAMB236. Well printed and presented collection of songs. Got a question? No problem! 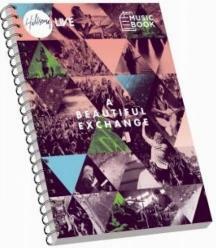 Just click here to ask us about A Beautiful Exchange Songbook.